NEW YORK— Premium tableware and home décor designer Juliska will partner with Bridge, an ecommerce platform, beginning May 1 to help authorized retailers increase their sales. Bridge considers itself as Dropbox meeting Amazon meeting Facebook. 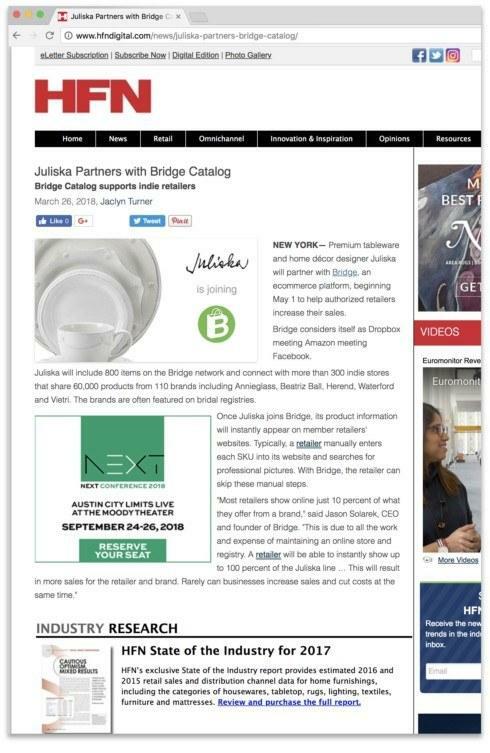 Juliska will include 800 items on the Bridge network and connect with more than 300 indie stores that share 60,000 products from 110 brands including Annieglass, Beatriz Ball, Herend, Waterford and Vietri. The brands are often featured on bridal registries. Once Juliska joins Bridge, its product information will instantly appear on member retailers' websites. Typically, a retailer manually enters each SKU into its website and searches for professional pictures. With Bridge, the retailer can skip these manual steps. "Most retailers show online just 10 percent of what they offer from a brand," said Jason Solarek, CEO and founder of Bridge. "This is due to all the work and expense of maintaining an online store and registry. A retailer will be able to instantly show up to 100 percent of the Juliska line … This will result in more sales for the retailer and brand. Rarely can businesses increase sales and cut costs at the same time."